Off the shores of Newfoundland, Canada, an ecosystem is unraveling at the hands (or pincers) of an invasive crab. "It's complicated," said Christina Simkanin, a biologist at the Smithsonian Environmental Research Center, "which isn't a super-satisfying answer if you want a direct, should we keep it or should we not? But it's the reality." That's been devastating for fish that spend their juvenile days among the seagrass. Where the invasive crabs have moved in, the total weight of fish is down tenfold. 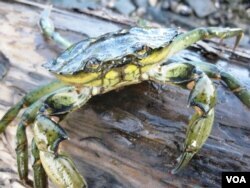 But the invasive European green crab pushes native crabs out of their burrows. Under pressure from the invader, native crabs are eating less marsh grass. Marshes are recovering, and their carbon storage capacity is growing with them. In this May 8, 2016 photo, eelgrass grows in sediment at Lowell's Cove in Harpswell, Maine. Simkanin and colleagues compiled these studies and more than 100 others to see whether the net impact on carbon storage has been positive or negative. They found that the ones overtaken by invasive species held about 40 percent more carbon than intact habitats. They were taken by surprise, she said, because "non-native species are thought of as being negative so often. And they do have detrimental impacts. But in this case, they seem to be storing carbon quicker." At the Smithsonian Environmental Research Center where she works, the invasive reed Phragmites has been steadily overtaking a marsh scientists are studying. 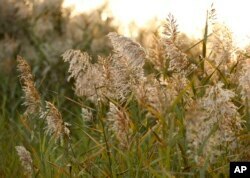 Phragmites grows much taller, denser and with deeper roots than the native marsh grass it overruns. But those same traits that make it a powerful invader also mean it stores more carbon than native species. "Phragmites has been referred to as a Jekyll and Hyde species," she said. Not all invaded ecosystems stored more carbon. 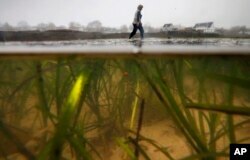 Invaded seagrass habitats generally lost carbon, and mangroves were basically unchanged. But on balance, gains from marsh invaders outweighed the others. Phragmites plants growing on Staten Island draft in a breeze in the Oakwood Beach neighborhood of Staten Island. To be clear, Simkanin said the study is not suggesting it's always better to let the invaders take over; but, it reflects an active debate among biologists about the role of invasive species in a changing world. "One of the difficult things in the field of invasion biology is, there aren't a lot of generalities," said Brown University conservation biologist Dov Sax, who was not involved with the research. "There's a lot of nuance." The prevailing view among biologists is that non-native species should be presumed to be destructive unless proven otherwise. When 19 biologists wrote an article in 2011 challenging that view, titled, "Don't judge species on their origins," it drew a forceful rebuke from 141 other experts. Sax said the argument is likely to become more complicated in the future. "In a changing world, with a rapidly changing climate, we do expect there to be lots of cases where natives will no longer be as successful in a region. And some of the non-natives might actually step in and play some of those ecosystem services roles that we might want," he said. "In that context, what do we do? I definitely don't have all the answers."